Smartphone and tablet users probably know the perks of using a screenshot. It is a simple way to capture a piece of information that you need to forward to someone or to keep it for yourself. When using various applications, it may often happen that some technical issues arise and you need to contact tech support. That’s when screenshots come in handy. Then, when you want to forward your texting communication to the third person, it takes less time just to snap a screen to save messages and not to copy and paste them. Next time when you get a high score in a game you play, don’t forget to take a screenshot as well. Taking screenshots cannot be easier, just press and hold the Sleep button on the top or side of your iPad device and then press the Home button. Screenshots are automatically saved in Photos, Albums, in Camera Roll folder with other photos. However, there will be times when you will need to edit a screenshot. For instance, you took a screenshot of some email communication but you don’t want to disclose all the info. In such situations you should use an app that can edit screenshots directly or at least turn them from image file formats to Word or any other editable format. If you need to edit images in .docx format, there is an app for that- Image to Word. Image to Word converter is a mobile app that works with iPhones and iPads. This mobile app converts image file formats, even screenshots into an editable Word document. 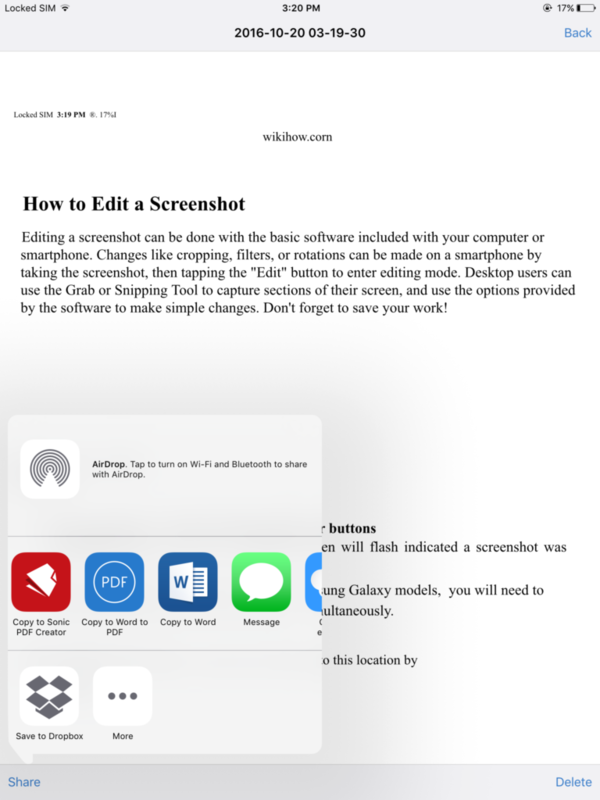 In order to edit a screenshot on iPad, you will need Image to Word and any app that views and edits .docx files, such as Microsoft Office, Libre Office, Office Suite etc. The first step is to open the app and to access your Photos folder to choose a screenshot you wish to edit. As soon as you have chosen the right screenshot, conversion will start. When the image (screenshot) is converted to .docx, the conversion result will show up within the app. To edit a converted file, tap on the file and then on the Share button. Choose an appropriate application from the Open in menu, such as Microsoft Word and start editing a screenshot. Image to Word app works with all types of image file formats so you don’t need to worry what format is your screenshot. When you upload a screenshot for conversion, it is sent to the conversion servers and nothing is done on your phone. In other words, you will transform your image screenshot into an editable .docx file without draining your battery. Next time you want to send a screenshot to someone, remember that you can edit it as well and change parts of the screenshot you don’t want to be seen.